Before beginning a performance, many conductors pause, baton raised, for a collective anticipatory moment of silence. Not Mirga Gražinyté-Tyla. From the second the 30-year-old associate conductor of the Los Angeles Philharmonic strides briskly onstage in low patent leather heels, she exudes a sense of momentum. In an instant she is in motion, arms aloft, her torso twisting as she explodes into the downbeat of Tchaikovsky’s Symphony no. 4. After the powerful brass introduction abruptly ends, she gently coaxes the woodwinds and strings along with her left hand—deftly shaping the ensemble’s sound while the measures pass by in perfect linear order. It could be a daunting task to step into the shoes of Dudamel, who has been a sensation since his debut in Los Angeles 11 years ago, but the critical response to Mirga has been vociferously positive. Mark Swed, the Los Angeles Times’s classical music critic, called her “simply the most exciting young conductor to come along” since Dudamel himself. And that’s important, since the Phil is determined to attract a broader audience (read: patrons who aren’t old, white, and rich). That “something” was evident when Mirga was a child. There’s a video clip on YouTube of her as a ten-year-old contestant in a talent competition on Lithuanian television. In a black-and-white polka-dot dress, short lace gloves, and curls, she sings a poem set to music, accompanied by an orchestra. The confidence and the sly grin are instantly recognizable. As the song ends, she raises her arms, flashing a thumbs-up with both hands before curtsying. 11 she decided to become a choir conductor like her dad. It was one of the few musical programs she wasn’t too old to enroll in at the performing arts school in Vilnius. The two share a mutual respect. Mirga is quick to speak up if she thinks a musical adjustment needs to be made. In turn, Dudamel relies on her feedback. “Mirga is an impressive talent, which is immediately evident to anyone that works with her or sees her conduct,” said Dudamel via e-mail. In her own conducting, Mirga favors consensus building with the ensemble. “To achieve the spirit of a team—that is the point,” she says of the more than 90 musicians she leads during most performances. “I need their thoughts, their inspiration and preparation and engagement. And they need certain things from me.” She speaks often of the “partnership” between orchestra and conductor. 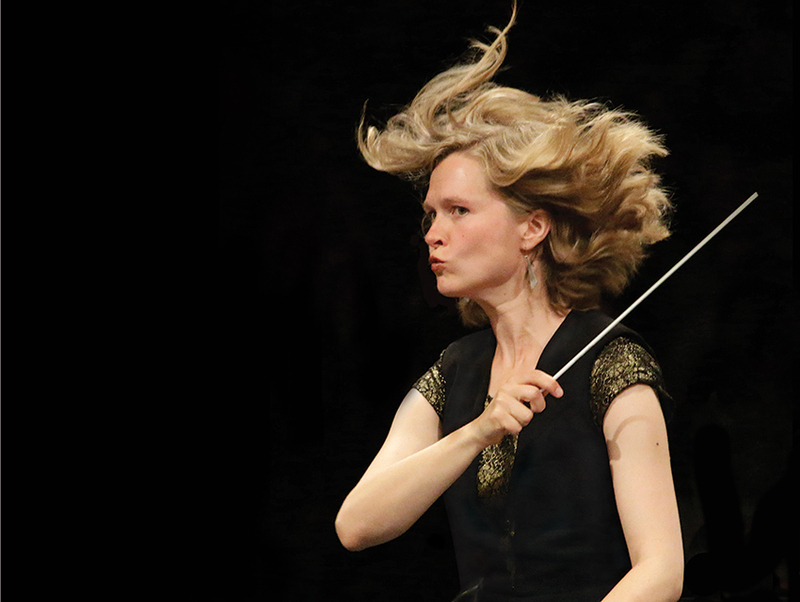 Administrators at the L.A. Phil have made diversity in the conducting ranks a priority; another woman, Susanna Malkki, has been appointed principal guest conductor for the 2017-18 season. But the conducting world is still dominated by men, even as orchestras are made up of more women than ever before (thanks, at least in part, to the introduction of blind auditions). The list of the “150 Busiest Conductors of 2015” on BachTrack, the classical music events database, includes just four women besides Mirga in the world. When I ask Mirga whether she has felt the same pressure, she answers without explicitly mentioning gender. “Being authentic is another great goal and an important one,” she says. “How to find it? Or what does that mean in conducting? And how can I be myself and do this job?” In the near future, Los Angeles audiences will have few opportunities to see how Mirga answers those questions. If you missed her Hollywood Bowl performance in July, you’ll have to wait until next March and April, when she will conduct three nights of Haydn and Mozart at Disney Hall. Next articleChef Jason Neroni from The Rose Shares His 10 Favorite Dishes in L.A.